^ Apparently without the knowledge of the Norwegian Rigsraadet (Council of the Realm), Christian pawned Orkney for 50,000 Rhenish guilders. On 28 May the next year he also pawned Shetland for 8,000 Rhenish guilders. He had secured a clause in the contract which gave future kings of Norway the right to redeem the islands for a fixed sum of 210 kg of gold or 2,310 kg of silver. Several attempts were made during the 17th and 18th centuries to redeem the islands, without success. ^ When Norway became independent again in 1906 the Shetland authorities sent a letter to King Haakon VII in which they stated: "Today no 'foreign' flag is more familiar or more welcome in our voes and havens than that of Norway, and Shetlanders continue to look upon Norway as their mother-land, and recall with pride and affection the time when their forefathers were under the rule of the Kings of Norway." ^ The other independent run Councils are Orkney and Comhairle nan Eilean Siar. Moray is run by a Conservative/Independent coalition. ^ No other part of the UK has any such oil-related fund. By comparison, as of 31 December 2010 the total value of the Government Pension Fund of Norway was NOK 3,077 billion ($525 bn), i.e. circa £68,000 per head. ^ Hjaltland – Shetland – ‘yet, land!” – 1871, Jakobsen, Jakob, fetlaraerial.com. Retrieved 14 May 2015. ^ "Placenames with -a, hjalt, Leirvik". Norwegian Language Council. (Norwegian). Retrieved 26 Mar 2011. ^ "Scalloway" Undiscovered Scotland. Retrieved 19 March 2011. ^ "Muness Castle". Undiscovered Scotland. Retrieved 13 March 2011. ^ a b Shetland, Scotland Climate - ウェイバックマシン（2010年12月15日アーカイブ分） climatetemp.info Retrieved 26 Nov 2010. ^ "Flora" visit.shetland.org. Retrieved 7 Apr 2011. ^ McFarlan, D., ed (1991). The Guinness Book of Records. Enfield: Guinness Publishing. p. 35. ^ "Home". Nature in Shetland. Retrieved 12 Mar 2011. ^ Williamson, Kenneth (1951) "The wrens of Fair Isle". Ibis 93(4): pp. 599-601. Retrieved 12 Mar 2011. ^ a b "Endemic Vertebrates of Shetland". Nature in Shetland. Retrieved 12 Mar 2011. ^ Nicholson, R.A.; Barber, P.; Bond, J.M. (2005). “New Evidence for the Date of Introduction of the House Mouse, Mus musculus domesticus Schwartz & Schwartz, and the Field Mouse, Apodemus sylvaticus (L.) to Shetland”. Environmental Archaeology 10 (2): 143–151. ^ "Breed History" Shetland Pony Studbook Society. Retrieved 20 July 2009. ^ "Shetland Pony" Equine World. Retrieved 20 July 2009. ^ "Sheep Breeds - S-St". Sheep101.info. Retrieved 1 May 2009. ^ Melton, N. D. & Nicholson R. A. (March 2004) "The Mesolithic in the Northern Isles: the preliminary evaluation of an oyster midden at West Voe, Sumburgh, Shetland, U.K." Antiquity 78 No 299. ^ "Sites make Unesco world heritage status bid shortlist" (22 Mar 2011) BBC Scotland. Retrieved 22 Mar 2011. ^ "Agreement between Magnus IV and Alexander III, 1266" Manx Society IV,VII & IX. isleofman.com. Retrieved 23 Mar 2011. ^ "History". visit.shetland.org. Retrieved 20 Mar 2011. ^ "The Shetland Bus" scotsatwar.org.uk. Retrieved 23 Mar 2011. ^ "Shetlands-Larsen - Statue/monument". Kulturnett Hordaland. (Norwegian.) Retrieved 26 Mar 2011. ^ Tallack, Malachy (2 April 2007) "Fair Isle: Independence thinking" New Statesman. Retrieved 19 Mar 2011. ^ "Tavish Scott MSP" Scottish Parliament. Retrieved 20 Mar 2011. ^ a b "Flag of Shetland". Flags of the World. Retrieved 19 Mar 2011. ^ "Economy". move.shetland.org Retrieved 19 Mar 2011. ^ "Home" Shetland Sheep Society. Retrieved 19 Mar 2011. ^ " Crofting FAQS" Scottish Crofting Federation. Retrieved 19 Mar 2011. ^ "Asset Portfolio: Sullom Voe Termonal" (pdf) BP. Retrieved 19 Mar 2011. ^ "Shetland's Economy". Visit.Shetland.org. Retrieved 19 Mar 2011. ^ "Public Sector". move.shetland.org. Retrieved 19 Mar 2011. ^ "Financial Statements 31 March 2011." Shetland Charitable Trust. Retrieved 8 Oct 2011. 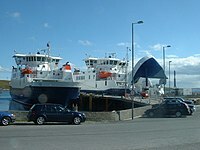 ^ "Powering on with island wind plan" (19 January 2007). BBC News. Retrieved 19 Mar 2011. ^ "Shetlands storm over giant wind farm" (9 Mar 2008). London. The Observer. Retrieved 19 Mar 2011. ^ Shetland News. shetland-news.co.uk. Retrieved 17 Mar 2011. ^ Hough, Andrew (2 Nov 2010) "Shetland Islands among best places to visit, says Lonely Planet guide". London. The Telegraph. Retrieved 7 April 2011. ^ "2011 Timetables" Northlink Ferries. Retrieved 7 Apr 2011. ^ "Sumburgh Airport" Highlands and Islands Airports. Retrieved 16 Mar 2011. ^ "Shetland Inter-Island Scheduled Service" directflight.co.uk. Retrieved 16 Mar 2011. ^ "UK Airport Statistics: 2005 - Annual" Table 10: EU and Other International Terminal Passenger Comparison with Previous Year. (pdf) CAA. Retrieved 16 Mar 2011. ^ "Shetland Islands Council". Heraldry of the World. Retrieved 2 April 2011. ^ "NAFC Marine Centre" North Atlantic Fisheries College. Retrieved 17 Mar 2011. ^ "Welcome! " Centre for Nordic Studies. Retrieved 17 Mar 2011. ^ "Haroldswick Methodist Church". Undiscovered Scotland. Retrieved 19 March 2011. ^ "Culture and Music". Visit.Shetland.org. Retrieved 20 Mar 2011. ^ "Shetland ForWirds" shetlanddialect.org. Retrieved 20 Mar 2011. ^ "Shetland Folk Society". Shelopedia. Retrieved 20 Mar 2011. ^ "Up Helly Aa" Visit.Shetland.org. Retrieved 20 Mar 2011. ^ "Shetland Produce" shetlandtourism.com. Retrieved 8 April 2011. ^ "Member Profile: Shetland Islands". International Island Games Association. Retrieved 20 Mar 2011. ^ "Area 3 Districts". methodist.org.uk. Retrieved 20 Mar 2011. ^ "Lerwick and Bressay Parish Church Profile". (pdf) shetland-communities.org.uk. Retrieved 20 Mar 2011. ^ "The Forty Fiddlers" Shetlopedia. Retrieved 8 Mar 2011. ^ Culshaw, Peter (18 June 2006) " The Tale of Thomas Fraser" guardian.co.uk. Retrieved 8 Mar 2011. ^ "Jarlshof" Undiscovered Scotland. Retrieved 2 August 2008. ^ "Hugh MacDiarmid" Shetlopedia. Retrieved 8 Mar 2011. ^ Morgan, Gavin (19 Apr 2008) "Shetland author wins acclaim". Shetland News. Retrieved 26 Mar 2011. ^ "Vagaland" Shetlopedia. Retrieved 8 Mar 2011. ^ "Shetland Life" Shetlopedia. Retrieved 17 Mar 2011. ^ "Publications" Millgaet Media. Retrieved 17 Mar 2011. General Register Office for Scotland (28 November 2003) Occasional Paper No 10: Statistics for Inhabited Islands. Retrieved 22 Jan 2011. Shetland Islands Council (2005) "Shetland In Statistics 2005". (pdf) Economic Development Unit. Lerwick. Retrieved 19 Mar 2011. Watson, William J. (1994) The Celtic Place-Names of Scotland. Edinburgh. Birlinn. ISBN 1841583235. First published 1926.